Truths of the Group Mind – Jack Campbell Jr. I used to moderate a group with some time issues, specifically a couple of prima donnas who liked the sound of their own voices. I went to a format I got out of The Complete Idiot’s Guide to Publishing Science Fiction by Karl Schroeder and Cory Doctorow. Basically, everyone gets a turn to talk before group discussion where they can only discuss their top three pluses and top three minuses. This helps both the group and the author to focus on what’s important. Usually by the time everyone has gotten their say, there’s not a lot left, and the format also minimizes tangents, circular arguments, and interruptions. I always thought the prima donna thing was odd. 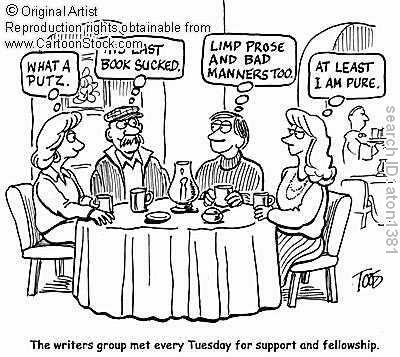 People tend to stereotype writers as being introverted, but there are always a few in every group that you couldn’t shut up if you wanted to. I like the idea of how to keep arguments from happening. I’ll have to suggest it.